6001 Middlefiskville was the former 60,000 square foot home of Sheplers Western Wear. The site sits on approximately 5 acres of land, and is located centrally in Austin on the Northwest corner of I-35 and 290 and adjacent to the former Highland Mall. AQUILA was aware of the Airport Boulevard Initiative and recognized this site as well positioned to obtain favorable zoning provisions under that initiative in the future which would allow significant vertical development. Further, the site was in close proximity to tremendous public transportation, including the Capital Metro train and bus stops. This made it an attractive long term investment opportunity, so long as an interim redevelopment use could be found to provide economic returns until such time that a denser project was needed in the marketplace. AQUILA helped our client secure the site and embark upon a redevelopment and leasing strategy. 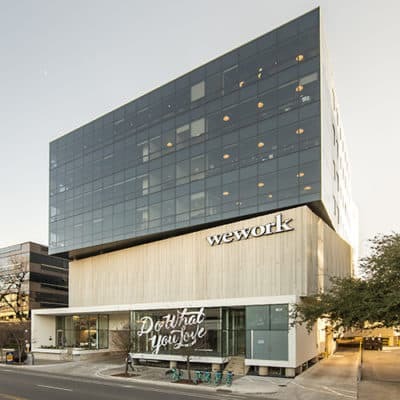 The positives of the site and its existing structure were clear: central Austin location, abundant amounts of parking and a structurally sound building with extraordinary wood in its beams, ceiling, framework and accents. But the challenge was equally as obvious: How do we economically redevelop a dysfunctional and worn-out building for new users with new requirements and set market rental expectations? Particularly if we thought that the building may be demolished for a denser project in the next 15 years. The biggest obstacle was in retooling the façade. The building had originally been built for Shepler’s and the exterior and interior exuded the western wear store’s brand. We’d need to find a creative, but not too expensive, way to refresh the façade, giving it a new look and modernizing it for a new generation of tenant. Our architects proposed using Richlite rain screen panels, an innovative new product that had not yet been used in the Austin market. These durable panels provided the look we were after and contained substantial recycled content. The next challenge was identifying potential users and securing tenants. 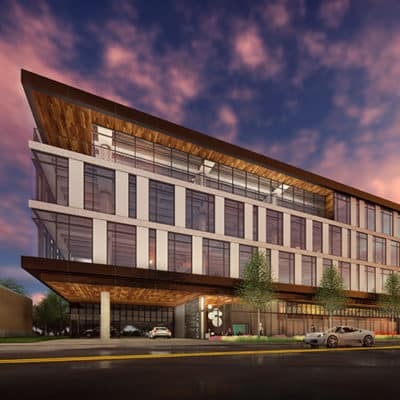 With its vast parking field and 60,000 square feet of interior space, AQUILA identified that it would be ideal as either a call center or a big box retail use. While the interior of the building was impressive, it took great vision to be able to picture what the exterior could be. We worked with several tenants through various renditions and 15+ rounds of revisions to create an exterior that would be both economically feasible and attractive as a retail façade. Ultimately, over the first year of ownership, AQUILA commercial worked to secure two retail tenants: The AVEDA institute, a salon/school, and Gold’s Gym, a large fitness user. Both of these tenants created a number of challenges. AVEDA uses a tremendous amount of water which necessitated increasing the water line capacity to the building and tenant. Gold’s Gym was installing a large lap pool, which required unique structural and enclosure elements to ensure that there would not be a plumbing failure and so that the temperature in pool area did not compromise their other fitness areas. In addition, the building was built in the 1970’s and though the structure was sound, all of the buildings systems needed to be brought up to code. 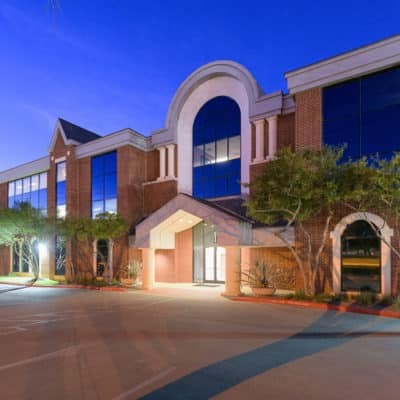 The entire building had to be reworked: the roof was replaced, new electrical was installed throughout, new sewer lines were brought in and plumbing was revamped, and new HVAC was installed. 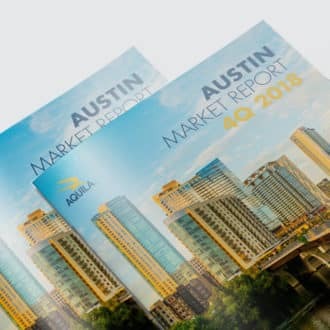 In all, around $3 million was put into the redevelopment of the site, but much more was gained in value to our investors and to this reemerging Austin submarket. 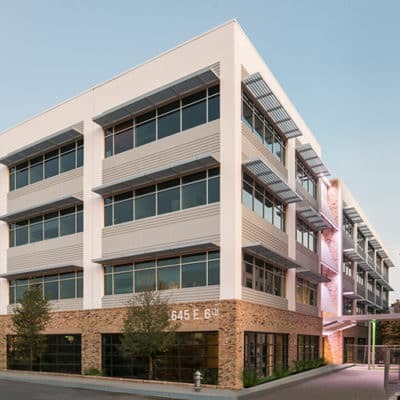 AQUILA’s redevelopment of this site turned a worn and dated vacant building on one of Austin’s most trafficked intersections and turned it into an attractive, economically productive building, bringing energy and life to a re-emerging Austin submarket. Moreover, this project represents the first major retail redevelopment in the immediate area. We believe it played a large role in solidifying what could occur with investment from private enterprise in this area. This project stands out as an example of how targeted investment in building infrastructure and exterior improvements can bring new life to a previously derelict property. The two long term, large tenants are happy with their new homes, and their clients appreciate the improvements. The before and after pictures says more than words: Rather than a dilapidated structure falling in disrepair and attracting vandalism and graffiti, you now have an attractive contemporary modern building serving the community and its constituents. Ready to talk about how to get the best value out of your commercial property? An AQUILA investment expert is ready to talk to you about your real estate options. Schedule your consultation today.